Breathtaking tropical beaches with crystal clear turquoise waters, amazing shopping, extraordinary world-class dining, non-stop nightlife (including many casinos), and friendly people are a few of the reasons so many people regard St. Maarten / St. Martin their "home away from home." 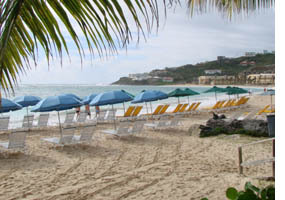 Some of our beaches even allow you to tan without tan lines! Two countries, Holland and France, share "SXM" with an open border, in a relationship that has been 100% peaceful for hundreds of years. When you arrive at our beautiful, ultra-modern Princess Juliana "SXM" International Airport on the Dutch Side, you're transported to paradise. There's lots to do here. One thing that's not-to-be-missed is Da Party Bus, an outlandish converted school bus with an authentic Creole House on the back. Take our word for it: it's a one-of-a-kind Caribbean party experience. To learn much more about our island, see www.everythingsxm.com. 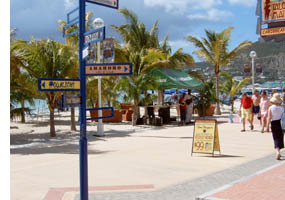 Their extensive site tells you everything you could conceivably want to know about SXM! And if you're looking for a great new place to stay, check out our own new all-suites boutique hotel, Baker's Suites -- a beautiful new oasis of serenity in the heart of busy Simpson Bay.